Without many (or any?) other options we dragged our luggage back down the steps, onto the street getting us, our luggage, and our small paper map good and wet as we marched through Irkutsk’s street to our new home. Soviet-style stairwell in our new home. Dingy doesn't even begin to describe it. Also, our apartment-mate was a young German who boasted that he hadn't showered in eight days - six days in the Gobi desert and then two days on the train. Jesse politely suggested that maybe he wanted to get in the shower right this very second. No, seriously. Get in the shower. The unshowered German in the living room/kitchen. Jesse liked him a little more because he had a giant jar of pickles. After dropping our bags and changing into dry clothes, we headed out to find a supermarket so that we could take advantage of the apartment kitchen. Twenty minutes later, with no supermarket in sight and the rain still pouring down we stumbled into a random Russian restaurant. The menu was in Russian and nobody spoke English so we walked around with the waiter pointing to authentic-looking food on other people's plates. Despite all this, we somehow ended up being served pizza, chicken fingers and french fries. The sauce of 1000 tears. Over my objections, the waitress cleared the complimentary ketchup that came with our fries. I was forced to shell out $1.50 for this sauce for the chicken fingers. Jesse still has not heard the end of it. But despite the rocky start we liked Irkutsk. It’s streets are lined with grand 19th century architecture, it had nice modern restaurants, including Prego, an Italian place that Jesse spotted on our taxi ride and (rightly) insisted that we return to, and gilded soviet-style waiting rooms in the train station. And more Adidas track suits than we had ever seen. Prego, where we ate our last proper meal for the next 72 hours. 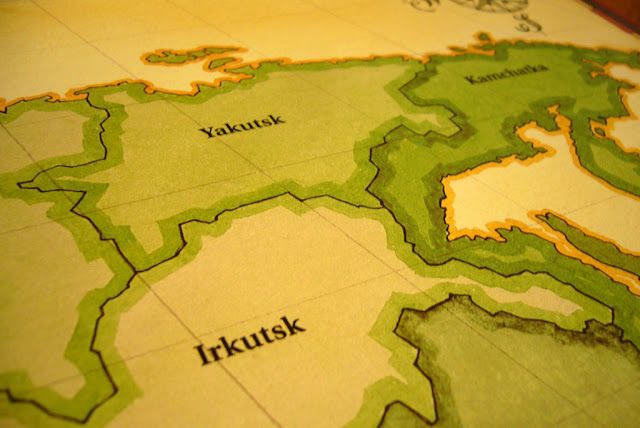 Proof that Irkutsk is part of Asia. The VIP waiting room at the Irkutsk train station. * Not to be confused with our visits to Paris of the South (Buenos Aires), the Paris of the East (Hong-Kong), or actual Paris (in France).